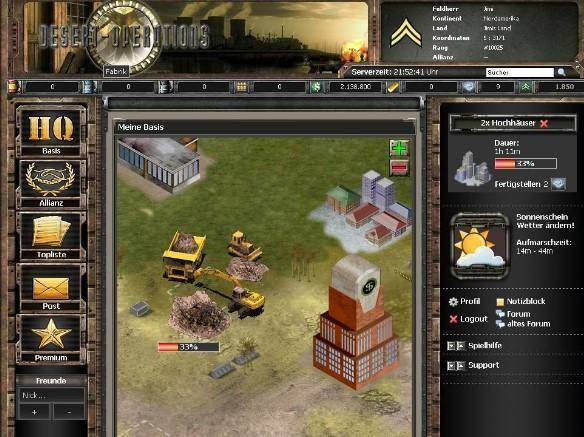 Developed by Playzo GmbH for Internet web browsers, Desert Operations is a free to play military Strategy Browser-based Game where you fight as the Ruler of a small country against thousand other players or make allies with them through clever diplomacy. Raise your influence on the world politics by creating alliances or making war declarations. Found alliances, so you and your allies can fight against your enemies. Trade with your allies and spy on your enemies. You have many possibilities to create your country and defend yourself against hostile takeover. Ready to play in your browser directly, there are four types of units: Ground (foottroops, armored vehicles), Air, Water and Defense. Also, there are different types of buildings: Producing buildings, Action buildings and Military buildings. Manufacturing building bring you Raw materials. They can be captured in an attack or lost(with the exception of the Ammunitions factories). Action buildings represent the different actions available, such as the start of an attack, or manage your bank account. The Military building you need to be able to produce these units.